Unless you've been living under a rock for the last couple of weeks (one of those cheap rocks that comes without internet or TV), you've heard of Susan Boyle. (If you really haven't, you can watch her video here.) It seems like such a simple story: Ugly old lady (relatively speaking) gets laughed at by the 'Britain's Got Talent' judges and audience because they assume she can't sing. She sings very well, and they all look like idiots. Score one for the ordinary people, right? All of those judges are jerks. Ha, ha, she really showed them! Personally, I was very confused when I saw the video for the first time. They were all laughing at the beginning, so I thought she was some sort of stand-up comedian. Then they started talking about singing, and I couldn't figure it out - what was so funny? She sang, and I thought, she sings really well, but she's not the greatest singer ever. What's the big deal? Eventually I figured it out, of course. They thought that since she didn't look like the typical 'good' singer on the show, she couldn't sing. Unattractive people are apparently very humorous. I suppose this all seems obvious (that they would pre-judge and laugh). I'm not sure that it is so obvious. Usually, when we see someone on stage, we assume they can perform until proven otherwise. And it's not as if most singers are at all good-looking! Ever been to the opera? I attended a community concert the other day. I'd estimate that around half of the performers were as plain-looking as Susan Boyle. Yet somehow, nobody laughed. The applauded politely and enjoyed the music. People really can appreciate talent. So why is 'Britain's Got' Talent different? From what I can tell (correct me if I'm wrong, as I've never watched an episode of any of them), the *'s Got Talent and *ian Idol shows derive around half of their entertainment value from the judges' and audience poking fun at poor singers. The producers intentionally mix some terrible performers in with the legit ones, purely so they can be insulted. I'm guessing that most of those performers look rather like Susan Boyle (to increase the fun, I suppose). So it's not that the audience and judges are horrible people who are biased against unattractive older people; instead, they've developed a Pavlovian response to those sorts of people due to the past history of the show. See an ugly person, get ready to laugh. That there is an occasional surprise is irrelevant. The producers are simply exploiting that response to increase ratings, as the viewers enjoy watching people insulted and made fun of. That's the tragedy of this entire situation. If Boyle had sung poorly, there wouldn't have been any story. No triumph over the 'pretty people'. No art snobs complaining that these 'modern singers' only exist for 'the look', that they don't have any real talent. No outrage that society considers it unacceptable to not be beautiful. Just a short laugh at the poor deluded fool. While I'm glad that Susan Boyle is doing so well, and I hope she has a successful career, it's sad that people don't seem to be learning the real lesson here. The lesson is not that it is wrong for people to judge only on appearance. Everyone knows that, or at least pays lip service to it. The lesson is that you shouldn't enjoy judging people on any arbitrary criteria, and more importantly shouldn't laugh at people to boost your own ego. 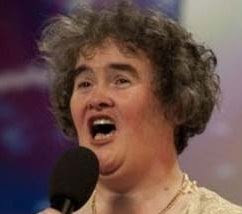 I'm afraid that we'll be just as surprised and shocked when the next Susan Boyle comes along.